I've been messing around pan roasting garbanzo beans recently, and I'm wondering if it's possible to make them creamy in the center and slightly crispy on the outside, like good potato home fries. 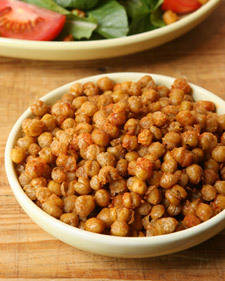 I don't have a lot of experience with garbanzos, so I don't even know if this texture is possible to achieve. I'm currently getting somewhat of a chalkier texture than I'd like (using canned beans and pan roasting on medium heat for 10-20 minutes). Slightly overcook the beans. It makes them softer, and therefore creamier. Let them drain completely, while still wet dredge with garbanzo flour (or some flour). Thoroughly dry them on a flat surface. Fry on pretty high heat using as little oil as possible, and not for very long, either. Another note: I usually make two or three large batches of beans every couple of months. I separate the yield out into 1-2 cup servings and freeze them. I have found that beans which were frozen, but not for very long have that delightful creamy center when fried, but not as crisp an exterior. The common theme is to drain and dry canned chickpeas, and then deep fry them for about 5 minutes or so. They can then be dusted with herbs or spices, if you desire. Of course, you can also use beans that you cook yourself in the traditional manner, then drain, dry and deep fry. I suspect that the longer frying period is intended to make a crunchy snack, but you may wish to experiment with shorter times to get a crispy exterior while retaining the creamy inside. Not the answer you're looking for? Browse other questions tagged beans chickpeas or ask your own question.